This hot stamping machine is designed for the commercial production of Hot Stamping of the Holograms and allied Products, using PET & Hot Stamping Foils of various thicknesses from 12µ (twelve microns) up-wards. Due to the highly automated nature of this latest equipment, the end-user can plan and control all the operating variables and it is very user friendly. 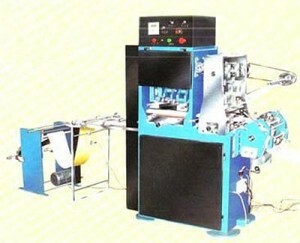 The operator of the hot stamping machine can control the web speed from a single control panel. This unique feature ensures that optimum results are obtained with minimum wastage. The stamping die will be either zinc or copper for longer machine life.